Identification: Upperside is brown-black. Forewing has few clear dots and very dim markings; patch at end of cell is grayish. Male forewing has many raised white hairs. Hindwing fringes are dark. Male has a costal fold containing yellow scent scales; female has a patch of scent scales on the 7th abdominal segment. Life history: During the day males perch on hilltops to seek females, usually sitting on the ground or on low twigs. Females lay eggs singly under leaves of the host plants. Caterpillars feed on leaves and live in shelters of rolled or tied leaves. Fully-grown caterpillars hibernate. Caterpillar hosts: Lupine (Lupinus), golden banner (Thermopsis), Lotus, and other legumes. Habitat: Open areas including mountain grasslands, marshes, sand plains, seeps, streamsides. Range: In the west, from Alaska and the McKenzie River delta south to southeastern Manitoba; south through the western mountains to southern California, southern Arizona, and southeast New Mexico. In the east, northern New England west to Wisconsin; south in the Appalachians to Virginia. 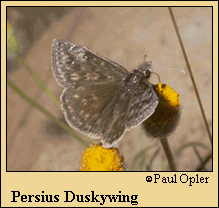 Comments: The Columbine, Wild Indigo, and Persius dusky wings belong to the "Persius complex," a confusing group of very similar butterflies. Conservation: Populations in the Midwest and Northeast found in pine-oak barrens should be monitored and conserved. Management needs: Manage habitat of lupine-feeding populations by mechanical disturbance or infrequent burns (no more frequent than every 5 years).